• Why medium-rare steak is so popular. 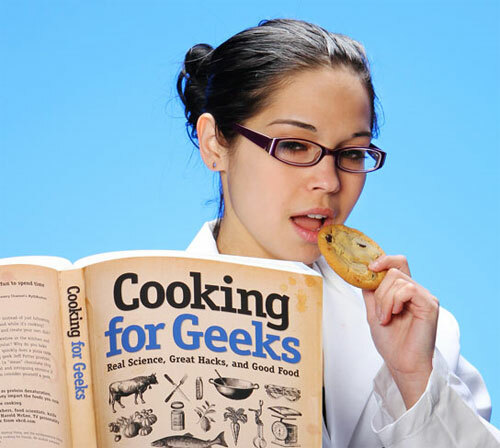 • Why we bake some things at 350° F/175° C and others at 375° F/190° C.
• How quickly a pizza will cook if we overclock an oven to 1,000° F/540° C.
• How to initialize your kitchen and calibrate your tools. • Important reactions in cooking, such as protein denaturation, Maillard reactions, and caramelization, and how they impact the foods we cook. • How to play with your food using hydrocolloids and sous vide cooking. Read on for a couple of sample recipes. Kind of know what you want to eat, but aren’t sure? Google Recipe View can help. 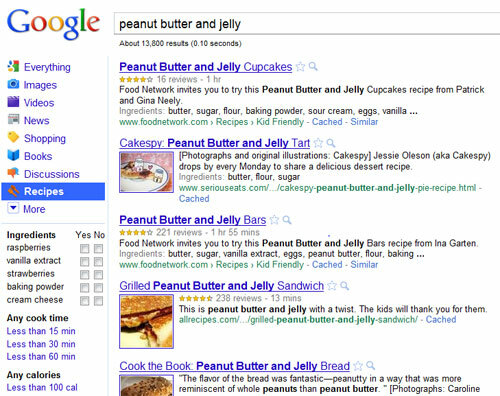 Now, search results include a recipe tab, complete with popular (and not-so-popular) ingredients. So if you are looking for a chicken soup recipe with turnips, but not parsnips, Google knows where to look, giving 784 recipes to choose from. Go ahead and try it now. Finding something to cook just got a whole new makeover. Finding a recipe that looks interesting is usually just a starting point. The personal embellishments and preferences of the actual cook making the meal always trump what’s written down. Sometimes however, you want to follow a recipe exactly. Whether it be for reasons of taste or ratios, that recipe usually needs to be scaled up or down. 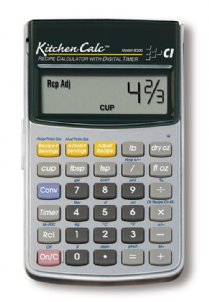 The Kitchen Calc works in units common to the kitchen such as fractions, Celsius and Fahrenheit. The handheld calculator converts cooking volume units and also units of weight. Even dash and pinch are represented. Of course, while the Kitchen Calc may handle those pesky fractions, it also works as a standard calculator too.